DOWNLOAD your copy of January 2019 issue! 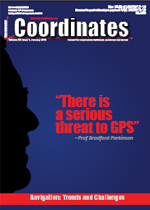 "There is a serious threat to GPS"
Carlson Survey - Developed by surveyors for surveyors! The new generation of manual total stations - Leica FlexLine Series! Integrated Positioning, Navigation & Timing test solutions by Spirent!